In Yalta, its famous Swallow’s Nest is not a bird’s nest, but rather a Love Nest, built by Baron von Steingel for his ballerina mistress. It seems that it was a trend at that time for men of standing to have ballerinas as mistresses, so the good Baron was keeping in step with trends. In Ukrainian, “Maya Lastochka” or My Swallow is a term of endearment used to refer to one’s sweetheart. Interestingly, prior to the Baron’s castle, there was another structure on this site, a wooden cottage also called “Love Castle”, which was built for a Russian general. As you can see from the photos of Swallow’s Nest, this is indeed a very romantic site. This famous Yalta sightseeing attraction was built in 1911 by Baron von Steingel, a German oil magnate who lived in St. Petersburg. His Castle of Love is a miniature castle which resembles a medieval knight’s castle. Perched precariously on the sheer Aurora cliff on the west of Yalta, it can be accessed by boat or car. In 1927 a terrible earthquake caused massive destruction in Yalta and sections of the castle collapsed into the sea, but the most impressive part survived. The castle was restored in the 1970s and it is now a popular tourist attraction, although there is nothing to see inside. This tinsel castle has been featured in many Russian films. An Italian restaurant now operates there however we are told that the food is expensive and not highly rated. Across the bay from Swallow’s Nest are restaurants from which you can enjoy a good view of the castle. There are also souvenir shops where you can buy postcards of Swallow’s Nest. 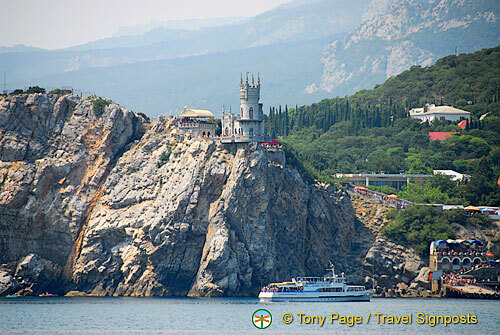 If you arrive in Yalta by boat, you’ll have a nice view of the castle as your boat streams into Yalta Bay. From Yalta Bay itself, many local operators run tours to Swallow’s Nest.